Influencing the endurance in elite sports is one of the key points in modern sports science. Recently, a new class of prohibited substances reached in the focus of doping control laboratories and their misuse was classified as gene doping. The adenosine monophosphate activated protein kinase activator 5-amino-4-imidazolecarboxyamide ribonucleoside (AICAR) was found to significantly enhance the endurance even in sedentary mice after treatment. Due to endogenous production of AICAR in healthy humans, considerable amounts were present in the circulation and, thus, were excreted into urine. Considering these facts, the present study was initiated to fix reference values of renally cleared AICAR in elite athletes. 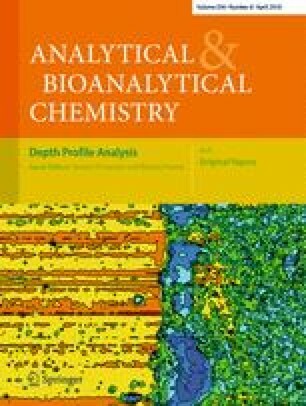 Therefore a quantitative analytical method by means of isotope-dilution liquid chromatography (analytical column: C6-phenyl) coupled to tandem mass spectrometry, after a sample preparation consisting of a gentle dilution of native urine, was developed. Doping control samples of 499 athletes were analysed, and AICAR concentrations in urine were determined. The mean AICAR value for all samples was 2,186 ng/mL with a standard deviation of 1,655 ng/mL. Concentrations were found to differ depending on gender, type of sport and type of sample collection (in competition/out of competition). The method was fully validated for quantitative purposes considering the parameters linearity, inter- (12%, 7% and 10%) and intraday precision (14%, 9% and 12%) at low, mid and high concentration, robustness, accuracy (approx. 100%), limit of quantification (100 ng/mL), stability and ion suppression effects, employing an in-house synthesised 13C5-labelled AICAR as internal standard. The study was carried out with the support of the Manfred Donike Institute for Doping Analysis, Cologne, Germany, the Federal Ministry of the Interior of the Federal Republic of Germany and the Federal Office of Sports, Bern, Switzerland.